Please note our gym will be open today from 1:00 PM to 4:00 PM for Open Gym. All other classes will be cancelled the Labor Day holiday. We encourage you to enjoy this beautiful day with your friends and family. Over the labor day weekend, Greg Amundson and Bailey Feeney visited the infamous SEALFIT compound in Encinitas, CA., to receive mentorship and training in Warrior Yoga from retired Navy SEAL Commander and Yoga teacher Mark Divine. 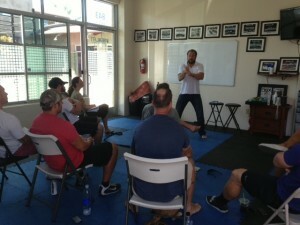 During their four day training, Greg taught the SEALFIT staff and instructors the “Amundson Way” of briefing the CrossFit workout, and shared with them the finer points of providing Athletes with inspiration and motivation. Special thanks to Mark and the entire SEALFIT team for a great training experience and for their continued support of the Warrior Yoga program at CrossFit Amundson.